The current issue of Tablet Magazine features an article titled “Doctor Who? Doctor Jew” that examines the parallels between Judaism and the popular BBC television series. The similarities are interesting, but I’m not sure that they are intentional. The original writer for the show was Sydney Newman, a son of Russian Jewish immigrants who got a job at the BBC just as “Doctor Who” was being planned. Most of the similarities probably reflect ideas that were floating around in Newman’s head. The Doctor, a member of a superior race called the Time Lords, occasionally slips into a new body, acquiring not only a new face but also a new personality. Of course, the Doctor manages to reincarnate “in place.” He skips over conception, birth, and childhood. He reincarnates as an adult, with all his memories intact, in the same physical location and even wearing the same clothes. A lot of us would like to know that trick! Before the destruction of the Second Temple in the year 70 C.E., Judaism was like most other religions in focusing on “sacred space.” Sacred space consists of specific locations or structures that are set aside for (and often chosen by) the Deity. Many Jewish practices and beliefs of that era involved sacrifices and rituals in the temple. After the temple was destroyed and the Jewish people were scattered, practices that depended on the temple were impossible. As a solution, Rabbinic Judaism developed practices involving “sacred time.” Sacred time consists of days or durations that serve the same purpose as sacred space, sanctifying certain actions and dedicating them to God. For example, Orthodox Jews see the Sabbath as sacred time, so they don’t work or do anything that changes the state of the universe between sundown Friday and sundown Saturday. That time is set aside for worship, ritual, and religious study. Sabbath observance is an example — almost all religions have them — of what I call “this is our story and we’re sticking to it.” Modern Jewish scholars concede that there is scant Biblical support for the Sabbath practice. They think that the ancient rabbis misinterpreted the Biblical texts on which they based their decision. Another example is provided by Jewish dietary laws that are based on a passage in which the same Hebrew word could mean “milk” or “fat,” depending on the missing vowels. Modern scholars believe that because the ancient rabbis assumed the Bible was perfect, they thought it could not contain redundancies. Reading the word as “fat” would have reiterated a law stated elsewhere in the text. As a result, the rabbis read the word incorrectly as “milk,” yielding the interpretation that a Jew may not cook, eat, or profit from food that combines meat and dairy products. Anyway, Jewish practice is closely associated with sacred time in ways that practices of other religions are not. So there is at least a slight connection to Doctor Who. That said, the Doctor’s time machine travels both in time and space. 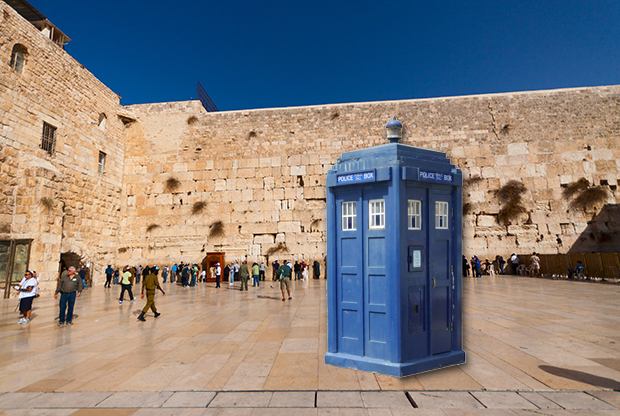 Even its name, TARDIS, is an acronym for “Time And Relative Dimensions in Space.” It doesn’t just sit in one place and travel through time, à la Rod Taylor’s invention in “The Time Machine.” So I think that saying the Doctor is specially related to time and not to space is, well, reading a lot into the text. I don’t know what the big revelation will be, but if Moffat wants to be theologically correct, then the Doctor has no name: that’s the secret. Moffat’s big reveal might tell us just how Jewish the Doctor really is. Back in the day, you had to be a member of the Church of England to graduate from Cambridge or Oxford. So maybe he’s that.